Chair Balancing - Cirque - Skyline Talent & Events - Exclusive representation for Cirque USA. Watch in amazement as our talented performer uses unbelievable acrobatic balancing skills stacking up to eight ordinary household chairs, and performs different acrobatic positions on top of them. He stacks and climbs these chairs using grace and athleticism that can only be found in the highest levels of acrobatics. Our phenomenal acrobat has astounded audiences all around the world with his signature cirque style handstand, twenty-five feet above the audience. 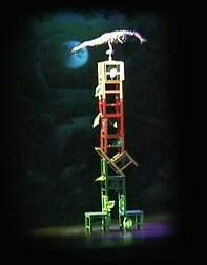 During this act's finale, the performer balances on one hand at the top of the stack and rotates around an astonishing 360 degrees.